Miss my review last week? You can find it here! Following their brief foray into the sewers last week, Goblin Slayer and his companions return to the city above ground for some rest. Priestess decides to enjoy a bath while the rest go on various errands, and in the midst of her relaxation, she’s interrupted by none other than the Sword Maiden. Priestess notices a series of scars all over the Sword Maiden’s body, and while she’s pretty vague about the situation, it becomes apparent that she was the victim of an attack similar to the one that the Priestess survived. Goblins seemingly tortured and assaulted her, but she made it through, and the experience motivated her to be an adventurer. She comments that Goblin Slayer seems dependable, but that one day he too would “disappear”. Shaken, Priestess returns to her room and reflects on the Sword Maiden’s words. The next day the party decides to return to the sewers, recognizing that there are more goblins to kill down below. Their stoic leader appears with an interesting companion: a canary. He explains that canaries are very sensitive to poison gas, which these goblins may be clever enough to use. As for the actual strategy, Goblin Slayer’s plan is simple: find the leader and kill them before slaughtering the rest of the goblins. Eventually they reach the end of the area covered by the map previously provided to them, venturing forth into unknown territory. The halls below are labyrinthine – containing relics and artwork from centuries before. The strung-up figure turns out to be a skeleton with a wig attached, and before they know it the doors are shut and locked behind them and the room begins to fill with poison gas as the Goblin Slayer’s new pet sings wildly. Springing into action, Goblin Slayer provides the Dwarf with the materials for concrete, which, combined with his magical abilities, allow them to plug up the holes and for the poison gas to dissipate. He also provides everyone with masks and materials to sniff instead in order to help nullify the negative effects. Soon enough, a horde of goblins is battering down the door, accompanied by their leader: a massive Goblin Champion! While the party does well on the initial waves, Priestess is mortified when Goblin Slayer takes a powerful blow from the Champion, grievously injuring him. Her Protection spell fades, and soon they are overrun. High Elf’s clothes are torn away as the goblins attempt to assault her, Lizardman is dog-piled by goblins, and in a horrific move, the Goblin Champion picks up the Priestess and literally takes a bite out of her arm and chest area. The Priestess’ screams reach Goblin Slayer’s ears, and he stirs from the stone coffin he found himself thrown into. Picking up the wig, he climbs up behind the Goblin Champion and begins using it to strangle the monstrous leader. While he’s unable to finish the job, he gashes out one of the Champion’s eyes with a powerful blow, forcing them all to retreat. Lizardman is able to heal Priestess in the aftermath, and the barely-conscious healer begs forgiveness from Goblin Slayer before the stoic knight collapses next to her, seemingly dead. This week’s episode is essentially part 2 of the “Sewer Mission”, and in case you were wondering: they found the boss! The opening scene with Priestess and Sword Maiden was important, but in many ways it felt rushed, and very vague. My understanding of the source material is that the Sword Maiden explains in quite a bit more detail exactly what happened with the goblins some ten years prior, as well as her own personal connection to Goblin Slayer. Unless she was playing coy, the anime appears to have taken a detour in this regard, as she appears to be unfamiliar with Orcbolg’s endeavors. Venturing into the sewers again was an entertaining jaunt, the banter continuing in the theme of an evolving adventuring party. Despite the occasional teasing, it’s encouraging to see the trust they all have in one another, constantly providing a more positive frame of reference than the inexperienced party from episode 1. The goblin ambush scene was great – plenty of drama and action as Goblin Slayer worked quickly to mitigate the advantages that the monsters had. 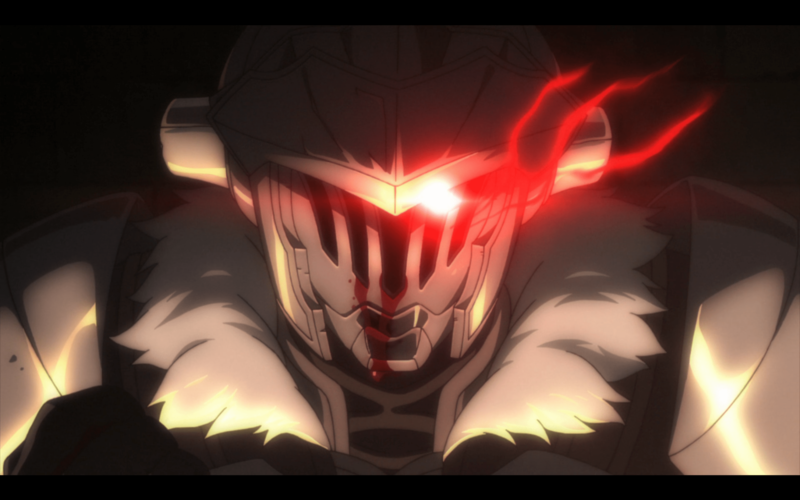 The animation choices here were particularly interesting, most notably a Matrix-style 360 degree shot of Goblin Slayer doing what he does best. Innovation with animation can be a tough thing to balance, but overall I was a fan of the CGI and animation techniques they used during the fight scene. It returned some of that weight that was missing in last week’s episode, so that each bone-crushing blow and goblin-rending slash had impact. One oddity from this week – the closing scene ends with a canary’s eye observing the battered and broken group in the empty hall. This scene goes on for a good 2-3 minutes. This was meant to serve as a backdrop for the credits to roll over, but it obviously didn’t quite work out that way. All in all, another awesome, action-packed goblin slaying adventure. We’ll find out next week if Goblin Slayer makes his Death Saving Throws or not!